WWW, December 2009 - Together with some crucial DUB versions, this 2005 two-albums-on-one-disc release contains the original 1979 Mikey Dread debut releases all mixed in King Tubby's Waterhouse Studio. It wasn't until Mikey Dread gained control over his own productions that his debut album "Evolutionary Rockers" was available on the digital market. That's over one quarter of a century in which the material was only available through collector's and traders' channels. Quite some material, especially when you consider that there's a DUB version of most of the vocal tracks on the album. 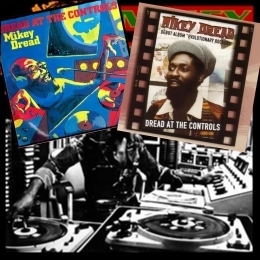 Containing classics like "Barber Saloon" and "Propper Education" (available for free and legal MP3 download on the Dubroom, just click on the links) in their extended version, the album captures Mikey Dread as he is still focused on Toasting ("Reggae Rapping") during these his early days. None less than seventeen outstanding tracks on one disc: you just cannot miss out on this one, when you like Roots Rockers Reggae and Dub and Toasting and King Tubby and an all-star Band, in short unless you hate Reggae with every bone in your body, you will simply have to have this one.